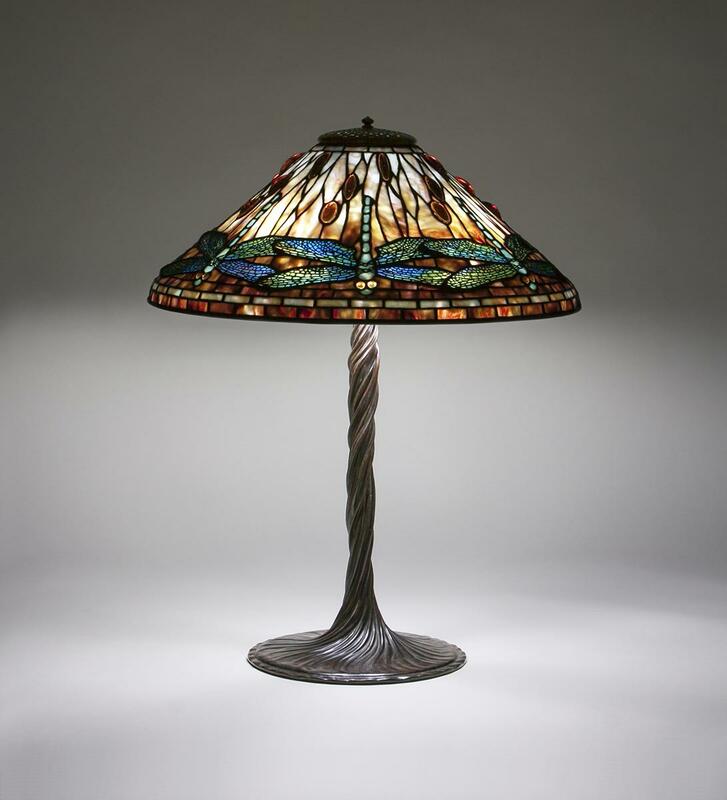 An original table lamp by Tiffany Studios comprising a 20-inch diameter example of the iconic Dragonfly Shade, designed by famed head “Tiffany Girl” Clara Driscoll at the turn of the twentieth century, on a sculptural bronze Twisted Vine Table Base. 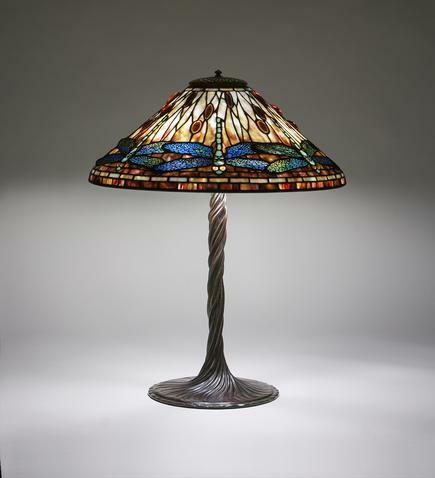 The leaded Tiffany glass shade depicts pale blue dragonflies, their vibrant deep blue wings streaked with purple and green, overlaid with openwork filigree, with bright eyes formed by rounded golden Favrile Glass jewels, set against a background of mottled glass ranging from cream streaked with gold near the crown to deep amber streaked with red throughout the lower portion of the shade, interspersed with rounded pressed Tiffany glass jewels in a rich amber shade. 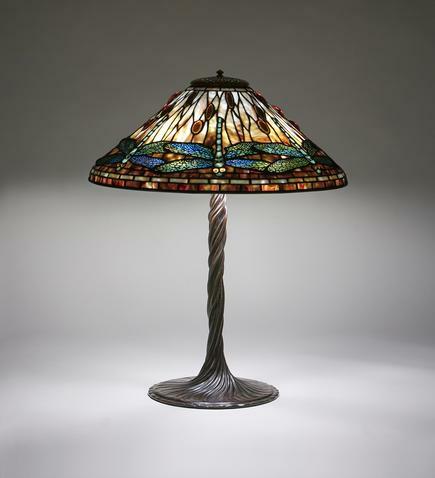 The rich warm brown patina of the Twisted Vine Table Base, an elegant base in the Art Nouveau taste and one of the most sculptural produced by Tiffany Studios, corresponds beautifully with the colors of the shade and matches the patina of the leading and the original reticulated heat cap. 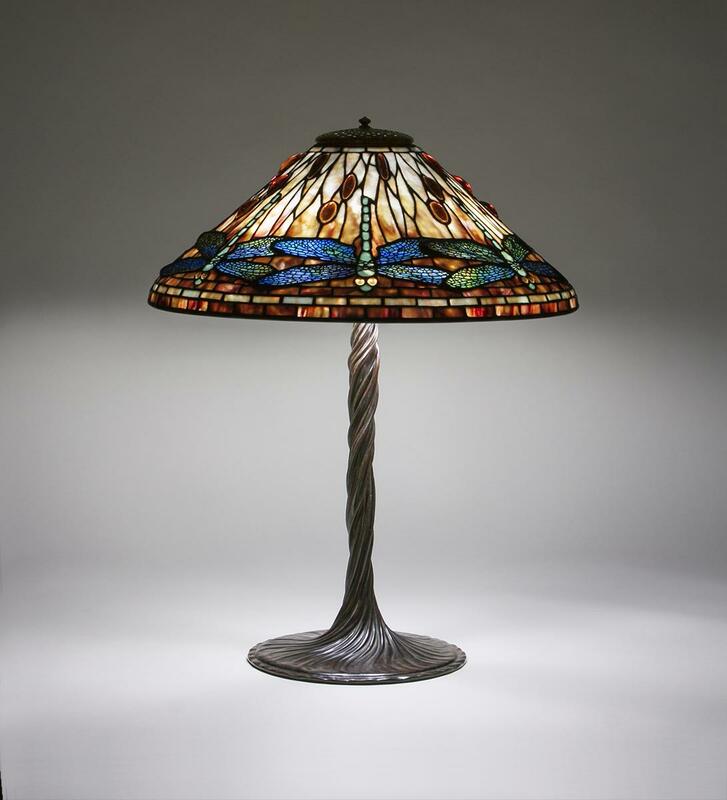 Both the shade and base of this original Tiffany lamp are signed.